Tonight we learn a little bit more about Zelena's Oz story *yawn* and Zelena forces Emma into performing really bad CPR on Hook to take away her powers. Henry has the best idea in the room. Again. Charming gets a little snarky with Emma and Hook and Henry finally becomes a nephew! There were two major ideas vying throughout tonight's episode even more strongly than we've seen before. Rumple tells Zelena "No matter what you change of your past, one thing shall remain the same - who you are. And that is a fate you can never escape." 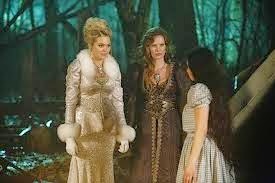 Glinda, however, emphasizes the importance of choice and Regina tells Zelena, "Don't tell me what I can be." Are you born evil? Or is it something you become? Regina certainly emphasizes (and inhabits) the idea that it is free choice. She is the hero "for today" and she can be evil when she needs to be. She chooses her destiny - finally. However, Zelena continually behaves in an evil way, even when she's given a choice, she chooses evil. Does that mean she chooses to be that way? For a short period time she seems to choose to be "innocent" but she always reverts. Does that mean she chooses it or that she is naturally that way? The question is exacerbated by the side story line with Rumple. He is trapped into specific behavior when Zelena holds the dagger. He doesn't kill Zelena because Regina holds the dagger. It looks like he's choosing freely when he offers Belle the dagger - and he is, but choosing to do evil. He deceives her and then tries to kill Zelena after all. He's continually fighting against his evil side... and it regularly wins out - but not every time. So is he evil, or does he choose to be evil? This idea has been explored throughout the series, but it was definitely brought to the forefront with a definite leaning toward the nurture rather than the nature side of the argument. Though it was only really brought up in 2 short back-to-back scenes, the question of what happens once Zelena is defeated is significant. Henry summed up his feelings succinctly when he tells Jiminy Cricket, "What's to talk about? We're home." At almost the exact same time Emma is plotting her return to "normal life" as she talks to Hook. She thinks they were happier there, but now that they both know the truth could they ever really be happy in New York again? I just hope that this conflict isn't simply avoided when Emma gets sucked into a new world making it a completely moot point. I was so excited for about half a second at the end of the epsiode and then she had to go and not be actually dead. blrgh. Here's hoping for a spectacular defeat in the finale so we don't have to see her next season. Ahem. The look of her spell was pretty amazing, though I'm impressed Rumple was able to make such perfect circles. It was nice having the band of misfits together again, facing down their foe, but that was probably the lamest fight scene the show has ever had. And when the dagger went flying I'm not sure I understand why no one went running for it immediately. That's kind of an important thing to not leave lying around. Emma: What is he going to do? I have magic. He's got one hand. Hook: I'm rather good in a fight. Hook: What, now I'm cannon fodder? Oh, and someone really needs to teach Emma how to do CPR. I'm thinking it was the blast of her magic leaving that woke up Hook, because there was really no actual mouth-to-mouth resuscitation going on there. However, Emma choosing to relinquish her magic to save Hook - significant, but not as big as I'm afraid a lot of people will make it out to be. Emma is the savior - she is a good person - she would have saved whoever it was, whether Doc Hopper, Hook, David, Regina, or probably even Rumple. This doesn't prove that she's madly in love with Hook; it proves that she chooses to do good, no matter the consequences. So am I saying that she doesn't love Hook? I don't know. But I do know that it's far too soon after the death of Neal for her to do much of anything. Even she has said that. There has been too much chaos. Is there some sort of attraction there? yes. But is it love? That I'm not sold on yet. So, I guess that Dr. Whale is some sort of super doctor who specialized in ... everything? Since he's so far cared for poison victims, coma patients, trauma, and now is magically an ob-gyn? Because there is only 1 doctor in the entire hospital? Also, how adorable is it to think that Snow and Charming, I mean Ginnifer and Josh are going to be going through this for real any day now!? Got to love the way Robin pops up out of nowhere to offer Regina his support, and I really felt like I needed to start clapping and chanting, "I do believe in Regina. I do believe!" I do have one bone to pick with Regina though. First, why does she even bring the brooch to the jail where Zelena is locked up. Wouldn't it have been better to hide it first? Then she says she's going to put it somewhere safe - like in her vault that everyone knows about? And that Zelena breached before? Sure Zelena doesn't have magic, but this doesn't really seem like a good idea to me. I loved seeing Belle and Rumple together again, but I kept saying he didn't promise her he wouldn't go after Zelena. He pulled a great sleight of hand followed immediately by pretty much the biggest distraction he could think of. However, I was much more giddy over the proposal before he revealed his deception and betrayal of Belle's trust in him. So now Zelena's turned into Smokey's green angry cousin and she's still bound and determined to make the spell work. Though I'm not really sure how she can without her ingredients.